Just when most of us thought that we have turned a page on racism in sport, Juventus striker Moise Kean was subjected to racist abuse after scoring a late goal to give the Turin side a 2-0 win at Cagliari in Serie A on Tuesday. In jubilation Kean, born in Italy to Ivorian parents, turned to the Cagliari fans behind the goal and folded his arms. A section of Cagliari’s supporters made strange guttural sounds, hideous signalling that is widely regarded as a racist insult in football. Monkey noises could also be heard among other sections of the crowd. Football has not seen this sort of behaviour for the first time (Blaise Matuidi and Sulley Muntari were victims in Cagliari in the past year or so). The 19-year-old Italian youngster is the latest victims of racist abuse that has been a stain on the soul of football for generations. Kean received racist jeers and insulting chants for much of the game this week but he held on and played a solid game. One would have expected a universal condemnation of the incident and huge support for Kean. Instead Juve captain, Leonardo Bonucci, tried to pin half the blame on Moise Kean. “I think the blame is 50-50, because Moise shouldn’t have done that and the [fans] should not have reacted that way. We are professionals, we have to set the example and not provoke anyone.” Adding insult to injury, Juventus coach Massimo Allegri too tried to balance it out, calling for a ban for the racists, but also agreeing with Bonucci that Kean shouldn’t have celebrated that way. This sort of political correctness is preposterous to say the least. Racist incidents in sports cannot be justified at any cost. The fact that football authorities often fail to show leadership, and now some players have begun to attempt shaming the victims is surely a new low. Kean’s abuse by Cagliari fans has intensified the belief among some leading black players of the game that the only way to confront racism is perhaps direct action. The feeling that sport cannot be allowed to continue in the shadow of racist abuse, as if nothing has happened, is gaining traction. Kean did nothing wrong. Even if the teenager’s celebration wasn’t up to the mark, how is racial abuse an appropriate response? It is exactly this sentiment that was shared by a galaxy of footballers like Memphis Depay, Raheem Sterling, Paul Pogba, Christian Benteke, Mario Balotelli, Jozy Altidore and Jeremy Ebobisse — all of whom called out Bonucci for mishandling the situation. Former Manchester City midfielder Yaya Toure called for FIFA and Uefa to take a stronger stance against racism. No wonder Bonucci lost the high moral ground for his attempts at victim-blaming but perhaps the bigger message we need to take home is this: When it comes to shocking examples of racial abuse, there is no 50-50. Racism is both unacceptable and reprehensible. Jeering at someone based on their skin colour is not the same thing as jeering at someone in a rival team. That is the fundamental difference and those who don’t understand what racism feels like, should perhaps just shut up. December 8: Manchester City’s Raheem Sterling laughs at Chelsea fans after they direct racial abuse at him during a Premier League match at Stamford Bridge. December 9: Chelsea and London Metropolitan Police investigate the allegations, leading to four Chelsea fans being banned from the ground. March 25: Sterling celebrates a goal for England by cupping his ears to fans who had been giving him and teammate Danny Rose racial abuse in a Euro 2020 qualifier against Montenegro. March 27: Sterling calls for Premier League to clamp down on racism. 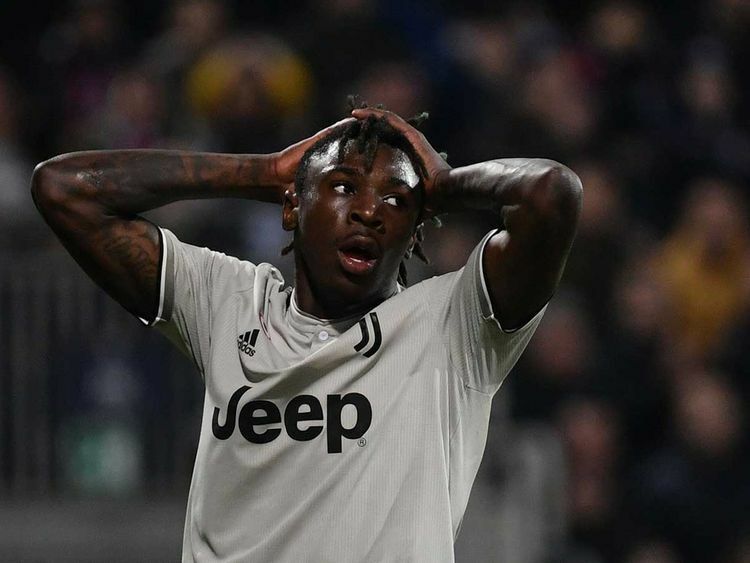 April 2: Juventus’ Moise Kean receives racial abuse during a Serie A match against Cagliari. April 3: Sterling leads calls for Fifa and Uefa to take a concrete stance against racism. April 4: Bonucci backtracks on comments that his teammate Kean was ‘50-50’ to blame for the abuse as he celebrated in front of Cagliari fans. Milan: Under-fire Juventus centre-back Leonardo Bonucci said Wednesday he had been “too hasty” when blaming young teammate Moise Kean for being partly responsible for racist insults hurled at him in a Serie A game at Cagliari. “After 24 hours I want to clarify my feelings,” said Bonucci, 31, on Instagram. “Yesterday (Tuesday), I was interviewed right at the end of the game, and my words have been clearly misunderstood, probably because I was too hasty in the way I expressed my thoughts. “Hours and years wouldn’t be enough to talk about this topic. Kean, along with his French teammate Blaise Matuidi and Brazilian Alex Sandro, were targeted by monkey noises and jeers throughout the match in Sardinia. But they increased in intensity after 19-year-old Kean scored the second goal in a 2-0 win. The Italian international celebrated with his hands outstretched in front of the Cagliari fans, taking to Instagram later to say his actions were “the best way to respond to racism”. But Bonucci had said after the game that Kean should not have provoked the home supporters and claimed his teammate was partly to blame. “I think the blame is 50-50, because Moise shouldn’t have done that and the Curva (Cagliari fans) should not have reacted that way,” said Bonucci.